Google translates 'Stjärnvandra' as 'Star Walk' and in some way that's exactly how this two-track e.p. can be experienced. 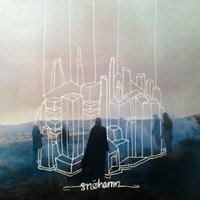 With this release, Swedish band Snöhamn seems to be trying to make an impact on the post-rock world. It's their third effort, according to their bandcamp page, and it's available as a pay-what-you-want download. So is their untitled debut by the way. So it seems like these are some very friendly Swedes playing very friendly music. A bit dark, chilly and mysterious music but very friendly nonetheless. There's two tracks on this e.p. Track one, named 'Stjärnvandra' is a typical but well-played post-rock song that lies somewhere between Sigur Ros and Explosions in the Sky. However it does have a raw edge, like sharp icicles hanging from a snowy canopy. The second track, named 'Huldra' is somewhat different. This ten minute lasting epos builds upon a long guitar drone and keeps on building towards an almost chaotic noise piece. Here you can clearly hear some influences from Godspeed! You Black Emperor, espcially in the dreamy atmosphere it creates.